This project attempts to examine the impact of supply chain risk on organisational performance in the context of the UK manufacturing sector. For this purpose, primary quantitative data was collected from 100 managers and supply chain employees of British manufacturing companies with the help of self-administered questionnaires. The obtained data was processed graphically and statistically in Excel and SPSS. It was revealed that manufacturing firms’ exposure to supply chain risk negatively influenced their productivity and cost-effectiveness. The lack of generalisability is the main limitation of this study. The researchers who investigate the role of supply chain management in organisational performance might be interested in this dissertation. Due to the recent globalisation and internationalisation processes, economic and technological interdependences are becoming more pronounced and prevalent in the business area (Avelar-Sosa et al., 2014; Curkovic et al., 2015). Today, every organisation has to manage a wide range of risks, which come from both internal and external environments, to remain competitive and survive in the long run (Dolci et al., 2017). As competition amongst companies increases, their supply chains also become more complex (Huong Tran et al., 2016). At the same time, this growing complexity is associated with more considerable risks that can produce a strong negative impact on the performance of any enterprise (Prakash et al., 2017). This project attempts to identify the extent to which supply chain risk affects organisational performance in the UK manufacturing sector. According to the existing management literature, there are numerous classifications of supply chain risk, the most notable of which distinguish between several risk categories such as suppliers, transport, warehousing, marketing, disaster, demand, production and process (Avelar-Sosa et al., 2014; Khojasteh, 2017). In turn, companies can mitigate supply chain risks through the adoption of one of three strategies, namely collaboration, control and avoidance (Waters, 2011; Vikulov and Butrin, 2014). Although the impact of supply chain risk on organisational performance is well-examined, too little academic attention has been given to the context of the UK manufacturing industry (Ouabouch and Pache, 2014; Fantazy et al., 2016). This project attempts to bridge this gap and add to the existing literature by establishing the link between supply chain risk and the performance of British manufacturing enterprises. The purpose of this dissertation is to examine the effect of supply chain risk on organisational performance in the context of the UK manufacturing sector. To identify the key supply chain risk categories relying on the existing management literature. To explore the management strategies commonly employed to mitigate supply chain risks. To establish the relationship between supply chain risks and organisational performance in the context of the UK manufacturing sector. To provide British manufacturing organisations with practical recommendations of how to minimise supply chain risk and contribute to their performance. This dissertation consists of five chapters, namely Introduction, Literature Review, Research Methodology, Analysis and Findings and Conclusion. Chapter 1 provides the reader with the background to the study as well as the main aim and objectives. The Literature Review chapter is responsible for reviewing and discussing the most relevant scholarly and empirical literature about supply chain risks and their impact on organisational performance. The research design process is presented in detail in the Research Methodology chapter. In Chapter 4, the obtained analysis findings are presented, interpreted and evaluated. Finally, in Chapter 5, the researcher critically discusses the key findings and provides practical recommendations on the basis of these findings. Risks in supply chains can be defined as a variation in the distribution of potential supply chain results, their value as well as likelihood (Bavarsad et al., 2014). This definition implies that the impact of supply chain risks is not limited to negative consequences, but can also result in positive outcomes. Nevertheless, according to the existing management literature, the risk concept has negative connotations (Christopher and Holweg, 2017; Kilubi, 2016). For example, Hohenstein et al. (2015) reported that risks in supply chains were usually associated with a probability of loss, danger or damage. Thus, supply chain risks usually lead to negative consequences and pose a serious threat to a firm’s financial and organisational performance. Similarly to Hohenstein et al. (2015), the researcher considers supply chain risks to be associated with negative outcomes. There are numerous classifications of supply chain risk depending on its effect on the company and its business environment (Aqlan and Lam, 2015). For instance, Avelar-Sosa et al. (2014) distinguished between three types of supply chain risk, namely risk in processes, risk in demand and risk in suppliers. 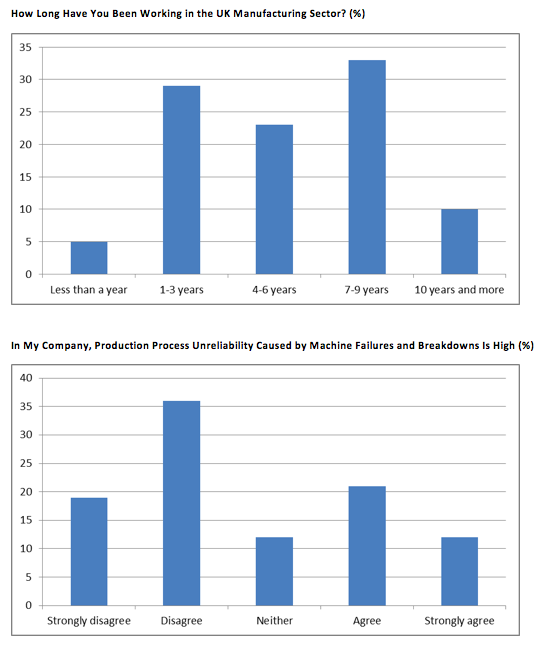 According to this classification, process risk is a result of production process unreliability caused by machine failures and breakdowns. In turn, demand risk and supplier risk result from inaccurate forecasts and volatile demand and poor communication with suppliers, respectively (Ho et al., 2015). Similarly to Avelar-Sosa et al. (2014), Qazi et al. (2015) mentioned that supply chain risks due to issues between supply and demand were amongst the most threatening to firms’ performance and financial sustainability. Although the classification of supply chain risk offered by Avelar-Sosa et al. (2014) provides the reader with certain sources of risk, it is too broad and lacks detail. A more comprehensive classification of supply chain risks was offered by Vikulov and Butrin (2014). According to the researchers, there are five supply chain risk categories, namely suppliers, demand, production, warehousing, transport and marketing. For example, risks associated with suppliers can include delivery failures, increased commodity prices and poor product quality (Chang et al., 2015). In turn, Sodhi and Tang (2012) reported that the damage and loss of goods in transport were amongst the most considerable supply chain risks in the transport category. Costs of warehousing such as changes in taxes and the damage of products during storage, which can be attributed to warehousing risks, were indicated by Shukla and Naim (2017) to threaten firms’ organisational performance. Companies that do not adhere to the principles of lean production can face overproduction and procurement risks, which also pose a threat to their effectiveness (Manuj et al., 2014). Finally, supply chain risks associated with marketing include volatile demand and the adoption of a wrong promotion strategy (Gorane and Kant, 2017). Although Vikulov and Butrin’s (2014) framework covers the majority of operational risks, it overlooks disaster as an important supply chain risk. In order to effectively operate in the marketplace, companies need to control risks within their supply chain (Bode and Wagner, 2015). According to Munyuko (2015), there are three strategies organisations usually undertake to mitigate supply chain risks, namely avoidance, control and cooperation. As mentioned by Curkovic et al. (2015), enterprises avoid product markets or geographical areas, which they consider as unacceptable. From the perspective of supply chain management, avoidance is associated not only with certain product markets or geographical areas, but also with suppliers and customer organisations (Schlegel and Trent, 2016). For example, an enterprise could avoid a specific product, supplier or geographical market if it considers the reliability of supply as poor (Gurnani et al., 2011). The avoidance strategy implies the removal of all requirements, which represent high risk (Skipworth et al., 2015). At the same time, the implementation of this strategy is impossible without a careful analysis and deep understanding of a company’s priorities in requirements as well as constraints (Arora and Sivakumar, 2016). Alternatively to the avoidance strategy, firms that adopt the control strategy tend to use the design process to better control contingencies and lower supply chain risk to acceptable levels (Manners-Bell, 2017). This can be achieved through the design of several paths to a solution and the selection of the lowest-risk decision option (Qazi et al., 2015). In turn, the cooperation strategy involves joint agreements between companies and their suppliers as a means of attaining uncertainty reduction (Fantazy et al., 2016). Prakash et al. (2017) argued that collaboration with suppliers helped to develop a more transparent supply chain as well as a more open sharing of information. Furthermore, this joint acceptance of the risk allows for minimising financial risks taken by each party (Gorane and Kant, 2015). At the same time, the quality of collaboration was mentioned by Munyuko (2015) to influence the effectiveness of supply chain risk management. For example, a lack of monitoring for potential supply chain risks may result in financial losses (Kirilmaz and Erol, 2017). However, given that companies have limited access to resources, they do not tend to actively employ this risk mitigation strategy since it requires budget for unplanned activities (Sundram et al., 2016). The role of supply chain risk in organisational performance was examined by Munyuko (2015) at the example of a private logistics services company. The researcher collected primary data from the firm’s employees and managers with the help of both questionnaires and interviews. Munyuko (2015) arrived at the conclusion that the effectiveness of supply chain risk management was directly linked with organisational performance. Similar outcomes were produced by Arora and Sivakumar (2016) who found that the adoption and active use of risk management practices allowed companies to more effectively deal with supply chain risks that came from both internal and external environments. Munyuko (2015) also discovered that market risks and demand risks were amongst the main sources of supply chain risks. These outcomes are in keeping with Wahdan and Emam (2017) who noted that volatile demand and wrong promotion strategies posed a serious threat to firm performance. The key limitation of Munyuko’s (2015) empirical study refers to a low level of generalisability since only a single organisation was involved in the research process. The impact of supply chain risk on organisational performance was also investigated by Ho et al. (2015). The researchers concluded that risks within supply chains could lead to production disruptions, which, in turn, resulted in significant financial and reputation losses (Ho et al., 2015). In the same vein, Vikulov and Butrin (2014) argued that the lack of effective supply chain management hampered companies’ ability to integrate their internal functions and link them with their suppliers’ and other supply chain members’ external operations. As a result, these organisations were not able to enhance their competitive performance (Fischl et al., 2014). It should be critically remarked, however, that Ho et al. (2015) reviewed only international journal articles, while no empirical tests were conducted. This fact significantly limits the reliability of their findings. The limitation of Ho’s et al. (2015) study was overcome by Wahdan and Emam (2017) who explored the impact of supply chain management on organisational performance in the context of Egyptian companies. In accordance with Okongwu et al. (2015), risk assessment plays an important role in supply chain management. Effective supply chain management allows organisations to reduce their vulnerability to supply chain risks, eliminate non-value adding activities and, hence, achieve higher levels of supply chain profitability (Tsanos and Zografos, 2016). 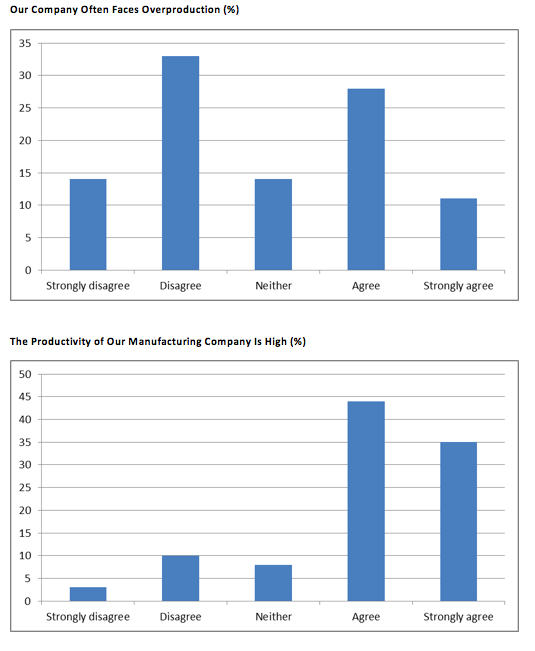 The analysis of almost 60 questionnaires allowed Wahdan and Emam (2017) to conclude that effective supply chain management produced a strong positive impact on firm productivity. Similar results were obtained by Ghadge et al. (2017) who reported that supply chain risk management helped companies decrease costs and improve profitability. It should be noted, however, that Wahdan and Emam (2017) examined the role of supply chain management on firm efficiency only in general. Although risk management is an important area of supply chain management, the researchers did not put an emphasis on this type of management, which can be viewed as a limitation. Processes, demand, suppliers, transport, production and warehousing can become a source of risk within the supply chain of UK-based manufacturing companies (Chang et al., 2015; Sodhi and Tang, 2012). In turn, productivity and cost reduction are used in this project as the key performance indicators (Tsanos and Zografos, 2016; Wahdan and Emam, 2017). This study is consistent with epistemology, which is concerned with the nature of knowledge (Novikov and Novikov, 2013). Speaking more precisely, the philosophy of positivism has been chosen since the researcher attempts to carry out this study in a value-free manner and produce highly reliable findings (Saunders et al., 2015). One of the main advantages of positivism is that it allows for adopting a quantitative approach, which is highly beneficial when establishing cause-and-effect links between variables (Merriam, 2015). On the downside, positivist projects are usually criticised for the lack of flexibility. After the issue of research philosophy is considered, it is important to select the most appropriate research approach (Patton, 2014). The deductive reasoning has been prioritised since it allows for following from constructing a conceptual framework on the basis of the most relevant risk management literature to practical tests. This approach has also been selected since it is highly compatible with the positivist philosophical stance (Bryman and Bell, 2010). Furthermore, there is a large body of literature that links supply chain risk with organisational performance (Chang et al., 2015; Sodhi and Tang, 2012; Tsanos and Zografos, 2016; Wahdan and Emam, 2017). At the same time, the main criticism of the deductive approach is that it does not lead to the production of novel findings since all hypotheses are deduced from what is already known (Saunders et al., 2015; Gomm, 2008). This project is in keeping with the survey strategy. This choice is justified by the need to gather a large amount of primary quantitative data and establish the relationship between supply chain risk and organisational performance in the context of the UK manufacturing sector. In accordance with Howell (2012), the survey refers to deductive strategies, which is another reason for its selection. Surveys help to answer who, what, how, how many and how much questions, making them highly popular with management researchers (Khan, 2011). By contrast, surveys are cross-sectional in nature, meaning their applicability to longitudinal projects is limited (Patton, 2014). The inflexible design of surveys is also considered as a limitation (Rao, 2008). Primary data was collected with the help of self-administered questionnaires since they allow for gathering quantitative data, which can be easily compared and contrasted (Novikov and Novikov, 2013). As a result, this data can be processed using both graphical and statistical methods of analysis to establish the relationship between dependent and independent variables (Kumar, 2014). Another reason for selecting self-administered questionnaires is the easiness of their distribution and administration (Bryman and Bell, 2010). As noted by Saunders et al. (2015), questionnaires are standardised and, hence, can be distributed amongst a large number of individuals in a short period of time. Finally, self-administered questionnaires allow for gathering primary data in a highly economical manner (Chawla and Sodhi, 2011). Considering the limited time and financial resources available to complete this project, the adoption of this data collection technique is justified. By contrast, questionnaires are characterised by a low level of personalisation, which can result in differences in interpretation and understanding as well as a lack of conscientious responses (Kumar, 2014). Questionnaires were distributed amongst UK-based manufacturing organisations’ managers and supply chain employees via social media and email. Potential respondents were selected using the non-probability convenience sampling technique, which does not provide each population member with equal chances to be selected (Singh and Nath, 2010). This choice is explained by the fact that the total population of managers and supply chain employees in the UK is very large to be sampled using probability techniques. The questionnaire, which can be found in Appendix A, was designed using the Likert scale methodology to adequately measure participant attitudes and perceptions and add to data validity and reliability (Daniel and Sam, 2011). The sample was drawn from 100 questionnaires without missing values. The obtained data was processed both graphically and statistically using Excel and SPSS Statistics, respectively. The following table defines all the variables used in the statistical analysis. The questionnaire was fully anonymous and did not focus on the collection of sensitive information (e.g. participants’ addresses, phone numbers or company names). All participants provided the researcher with written consent to ensure their voluntary participation in this project (Kumar, 2014). Respondents were free to skip any question they considered inappropriate. They were also free to withdraw from the data collection process at any time. No data was transferred to any third party to ensure respondent safety and security. Only the researcher had direct access to the collected data, which was disposed after all calculations were done. One of the key limitations of surveys is a low response rate (Bryman and Bell, 2010). That is why it was decided to distribute at least 300 questionnaires amongst potential respondents. In total, 137 questionnaires were returned to the researcher. Thus, the response rate of this project is equal to 45%. However, only 100 questionnaires without missing values were included in the sample. Another limitation refers to the fact that this study is focused only on the UK manufacturing sector, which poses a serious limitation to its generalisability. Hence, the produced empirical findings cannot be generalised to other sectors or geographical areas. Chapter 4 begins with the analysis of the background data collected from 100 managers and supply chain employees of UK-based manufacturing organisations. This analysis helps the researcher construct detailed respondent profiles and ensure that the sample is drawn from the members of the target population. 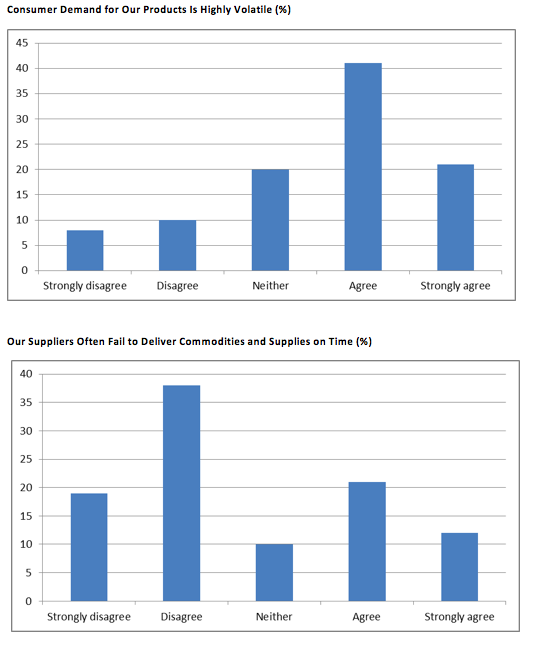 The sample was drawn from both managers (32%) and supply chain employees (68%). The majority or 44% of those surveyed reported they were between 36 and 45 years. In turn, the managers and supply chain employees of UK-based manufacturing firms who were between 46 and 55 years accounted for 24% of the sample. 22% of the individuals belonged to the ‘26-35’ age group. The participants who reported they were either between 18 and 25 years or older than 55 years accounted for 2% and 8% of the sample, respectively. One third or 33% of the participants have been working in the UK manufacturing sector for 7-9 years. As much as 23% of those who returned their questionnaire argued their working experience was 4-6 years. In addition, the sample was drawn from those who had been working for 1-3 years (29%) and less than a year (5%). The remaining 10% of the managers and supply chain employees indicated their working experience was more than 10 years. These findings show that the research participants’ experience is considerable and their knowledge of supply chain risks and organisational performance should be comprehensive. The graphical representation of these outcomes can be found in Appendix B. As mentioned in the Literature Review chapter, there are three strategies companies usually undertake to mitigate supply chain risks, namely avoidance, control and cooperation (Munyuko, 2015). The following chart demonstrates the extent to which the respondents agree their manufacturing firm uses the control strategy to minimise supply chain risks. 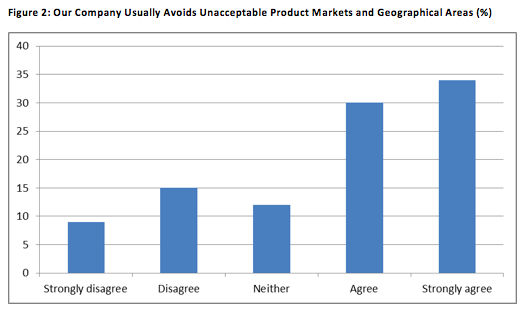 In total, around two thirds or 64% of the respondents either agreed or strongly agreed their manufacturing organisation usually avoided entering unacceptable product markets and geographical areas. 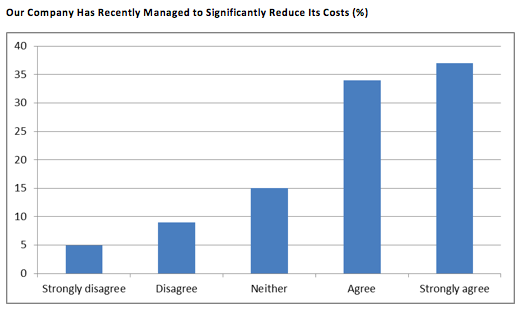 By contrast, the managers and supply chain employees who either disagreed or strongly disagreed their company used the avoidance strategy in supply chain management totalled 24% of the sample. Finally, 12% of those surveyed provided neutral responses. The following histogram demonstrates the perceived popularity of the control strategy. The analysis of the collected primary data demonstrates ambivalent outcomes. 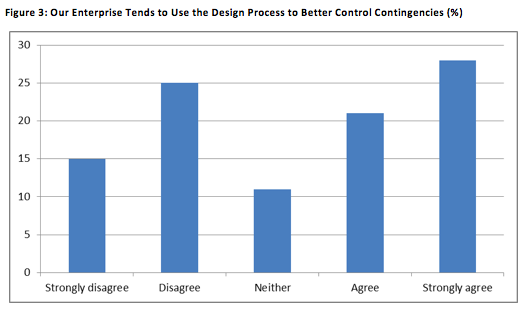 On the one hand, a total of 49% of the managers and supply chain employees either agreed or strongly agreed their manufacturing company tended to use the design process to better control contingences. On the other hand, the respondents who either disagreed or strongly disagreed their enterprise employed the control strategy totalled 40% of the sample. The remaining 11% of the individuals responded neutrally to this statement. The perceived popularity of the cooperation strategy with British manufacturing firms is presented as follows. In total, more than two thirds or 69% of the respondents either agreed or strongly agreed their company tended to establish joint agreements with suppliers to minimise uncertainty and make their supply chain more effective. 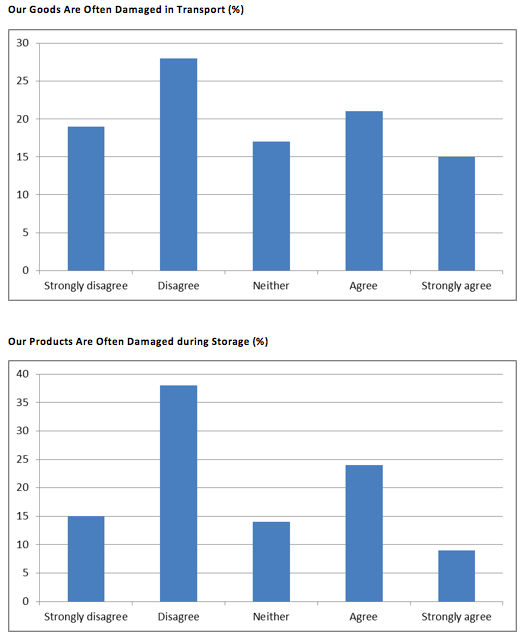 By contrast, the managers and supply chain employees who either disagreed or strongly disagreed with their counterparts totalled only 20% of the sample. Finally, as much as 11% of the individuals neither agreed nor disagreed with this statement and provided neutral responses. Thus, UK-based manufacturing enterprises prefer using the collaboration strategy as a means of minimising supply chain risks. Nevertheless, avoidance is also a popular supply chain strategy in the context of the UK manufacturing sector. As identified in the Literature Review chapter, supply chain risks come from both internal and external environments and can be associated with suppliers, processes, demand, transport, production and warehousing (Chang et al., 2015; Sodhi and Tang, 2012). The extent to which these risks are perceived to pose a threat to the respondents’ company is analysed with the help of the descriptive function performed in SPSS Statistics. The Mean of the DEM variable is equal to 3.57, which is the highest amongst all the variables. These outcomes demonstrate that risks associated with demand are considered by the overwhelming majority of those surveyed as threatening to their company’s financial sustainability. By contrast, the Mean of the remaining variables is lower than 3, which allows for stating that most participants do not perceive their manufacturing enterprise to face supply chain risks associated with production process unreliability, delivery failures, logistics failures in distribution and warehousing processes and overproduction. The Standard Deviation of all variables is close to 1, indicating that the distribution of data is approximately normal (Babbie et al., 2015). The linear regression function was performed in SPSS Statistics to identify whether there is a statistically significant relationship between the mentioned supply chain risks and UK-based manufacturing firms’ performance. Two independent variables, namely PRC and PRD form a statistically significant relationship with the dependent variable since their Sig. is much lower than the threshold value of 0.05 (George and Mallery, 2016). The table above demonstrates that B coefficient of PRC is negative, meaning the statistical link is also negative. Hence, the more UK-based manufacturing companies suffer from process unreliability, the lower levels of productivity they can achieve. These outcomes are partly in keeping with Wahdan and Emam (2017) who also reported that a firm’s inability to properly manage supply chain risks could result in lost productivity. Similar to PRC, the Sig. of the PRD variable is negative. Thus, it is possible to interpret the established statistical link as follows: the more frequently UK-based manufacturing enterprises face overproduction, the lower is the level of their productivity. None of the remaining predictors produce a statistically significant impact on the dependent variable since their Sig. or p-value is higher than the threshold value of 0.05 (George and Mallery, 2016). As mentioned by McCormick and Salcedo (2017), it is important to test the reliability of the designed regression model to make sure the produced analysis findings are credible and non-paradoxical. For this purpose, the Variance Inflation Factor (VIF), which measures collinearity in the model, was used (Babbie et al., 2015). The table above shows that the VIF of all predictors is lower than the threshold value of 5. Hence, none of the variables are collinear. The outcomes of the remaining reliability tests are presented as follows. The R-Square test allows for measuring the amount of variation in the result, which can be explained by the predictors in the model (George and Mallery, 2016). The value of the R-Square test is equal to 0.430. Hence, around 43% of the variation in the outcome is accounted for the independent variables. In turn, the F-Test indicates whether it can be assumed that all predictors in the model are zero (Babbie et al., 2015). The value of the F-Test is 3.51, meaning the likelihood of all independent variables being zero is significantly small. Hence, the reliability of the constructed regression model is high. In accordance with the Literature Review chapter, the effective management of supply chain risks positively impacts organisational performance by decreasing costs and expenditures (Ghadge et al., 2017). The extent to which supply chain risks are linked with UK manufacturing companies’ costs was examined using the linear regression function performed in SPSS Statistics. Only one independent variable, namely WAR forms a statistically significant link with the dependent variable since its Sig. is equal to 0.004. B coefficient indicates that the established relationship is negative and, hence, can be interpreted as follows: the more frequently UK-based manufacturing enterprises’ products are damaged during storage, the less they are capable of reducing their costs and expenditures. In the same vein, Sodhi and Tang (2012) arrived at the conclusion that risks associated with warehousing and transport posed a serious threat to firms’ profitability and performance. The Sig. of the remaining predictors is higher than 0.05, meaning none of them have predicting power over British manufacturing organisations’ ability to reduce their costs and expenditures. The table above indicates that the VIF is within its normal range (n = 5). 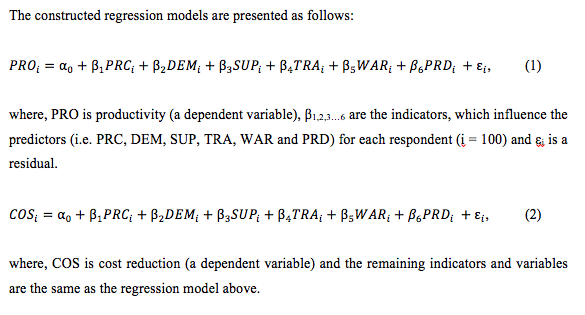 Hence, all predictors are acceptable and none of them should be excluded from the regression model. Around 31% of the variation in the analysis outcome is explained by the independent variables in the designed model since the value of the R-Square analysis is equal to 0.307 (McCormick and Salcedo, 2017). The F-Test value in higher than 1, meaning the likelihood of all independent variables being zero is small. Hence, the constructed regression model is reliable. The main aim of this dissertation was to examine the impact of supply chain risk on organisational performance in the context of the UK manufacturing sector. This purpose has been fulfilled by collecting primary data from 100 managers and supply chain employees of UK-based manufacturing companies and analysing it graphically and statistically. The analysis methods employed in this study included descriptive statistics, linear regression and graphical representation. The first objective was to identify the key supply chain risk categories relying on the existing management literature. This objective was attained in the Literature Review chapter. Using the findings from Chapter 2, it is relevant to conclude that there are numerous supply chain risks, the most considerable of which are supplier risk, transport risk, production risk, warehousing risk, demand risk and process risk (Vikulov and Butrin, 2014). At the same time, as demonstrated in the Analysis and Findings chapter, demand volatility and fluctuations are considered as the most challenging supply chain risks in the context of the UK manufacturing sector. These outcomes are partly in keeping with Qazi et al. (2015) who also reported that supply chain risks due to issues between supply and demand were amongst the most threatening to companies’ performance and financial sustainability. The next research objective was to explore the management strategies commonly employed to mitigate supply chain risks. According to the Literature Review chapter, there are three strategies, which companies usually adopt to mitigate supply chain risk (Arora and Sivakumar, 2016). These strategies are avoidance, control and cooperation (Gurnani et al., 2011). Although all three strategies are effective in certain contexts and situations, the analysis of the collected primary data demonstrated that UK-based manufacturing enterprises preferred using the collaboration and avoidance strategies to minimise supply chain risks. Similar outcomes were produced by Prakash et al. (2017) who found that collaboration with suppliers helped firms develop a more transparent supply chain. By contrast, the popularity of the control strategy was reported by the respondents as not considerable. The third objective was to establish the relationship between supply chain risks and organisational performance in the context of the UK manufacturing sector. This objective was fully attained in the Analysis and Findings chapter. Using the outcomes from Chapter 4, it can be concluded that the more UK-based manufacturing companies suffer from process unreliability, the lower levels of productivity they can achieve. Similar to this project, Ho et al. (2015) indicated that a firm’s inability to properly manage supply chain risks could produce a negative impact on its productivity. It can also be concluded that the more frequently UK-based manufacturing enterprises face overproduction, the lower is the level of their productivity. Overproduction is associated with additional costs since it ties up a company’s capital in stock, raw materials and finished goods (Aqlan and Lam, 2015). It is relevant to conclude that the more frequently UK-based manufacturing companies’ products are damaged during storage, the less they are capable of reducing their costs and expenditures. These findings are in keeping with those produced by Manuj et al. (2014) who argued that risks associated with warehousing and transport posed a serious threat to enterprises’ profitability and performance. At the same time, this project failed to establish any statistically significant link between risk in transport, risk in supply and risk in demand and the performance of UK-based manufacturing companies. The fourth objective was to provide British manufacturing organisations with practical recommendations as how to minimise supply chain risk and contribute to their performance. It is recommended that UK-based manufacturing companies should put a heavier emphasis on the issue of process reliability to make their supply chain more effective and, hence, achieve higher levels of organisational performance. Regular maintenance can help to minimise machine failures and breakdowns (Avelar-Sosa et al., 2014). It is also recommended that British manufacturing organisations should adopt lean production principles to avoid overproduction and, hence, minimise their costs and expenditures. By adopting the just-in-time principles, these enterprises are able to reduce flow times within their production system (Khojasteh, 2017). Aqlan, F. and Lam, S. (2015) “A fuzzy-based integrated framework for supply chain risk assessment”, International Journal of Production Economics, 161 (1), pp. 54-63. Arora, A. and Sivakumar, K. (2016) “Relationships among supply chain strategies, organizational performance, and technological and market turbulences”, The International Journal of Logistics Management, 27 (1), pp. 206-232. Avelar-Sosa, L., Garcia-Alcaraz, J. and Castrellon-Torres, J. (2014) “The effects of some risk factors in the supply chains performance: A case of study”, Journal of Applied Research and Technology, 12 (5), pp. 958-968. Babbie, E., Wagner, W. and Zaino, J. (2015) Adventures in Social Research: Data Analysis Using IBM® SPSS® Statistics, London: SAGE. Bavarsad, B., Boshagh, M. and Kayedian, A. (2014) “A Study on Supply Chain Risk Factors and Their Impact on Organizational Performance”, International Journal of Operations and Logistics Management, 3 (3), pp. 192-211. Bode, C. and Wagner, S. (2015) “Structural drivers of upstream supply chain complexity and the frequency of supply chain disruptions”, Journal of Operations Management, 36 (1), pp. 215-228. Bryman, A. and Bell, E. (2010) Business research methods, 3rd ed., Oxford: Oxford University Press. Chang, W., Ellinger, A. and Blackhurst, J. (2015) “A contextual approach to supply chain risk mitigation”, The International Journal of Logistics Management, 26 (3), pp. 642-656. Chawla, D. and Sodhi, N. (2011) Research Methodology: Concepts and Cases, New Delhi: Vicas Publishing House. Christopher, M. and Holweg, M. (2017) “Supply chain 2.0 revisited: A framework for managing volatility-induced risk in the supply chain”, International Journal of Physical Distribution and Logistics Management, 47 (1), pp. 2-17. Curkovic, S., Scannell, T. and Wagner, B. (2015) Managing Supply Chain Risk: Integrating with Risk Management, London: CRC Press. Daniel, S. and Sam, A. (2011) Research methodology, New Delhi: Gyan Publishing House. Dolci, P., Macada, A. and Paiva, E. (2017) “Models for understanding the influence of supply chain governance on supply chain performance”, Supply Chain Management: An International Journal, 22 (5), pp. 424-441. Fantazy, K., Tipu, S. and Kumar, V. (2016) “Conceptualizing the relative openness of supply chain and its impact on organizational performance”, Benchmarking: An International Journal, 23 (5), pp. 1264-1285. Fischl, M., Scherrer-Rathje, M. and Friedli, T. (2014) “Digging deeper into supply risk : A systematic literature review on price risks”, Supply Chain Management: An International Journal, 19 (5/6), pp. 480-503. George, D. and Mallery, P. (2016) IBM SPSS Statistics 23 Step by Step: A Simple Guide and Reference, London: Routledge. Ghadge, A., Fang, X., Dani, S. and Antony, J. (2017) “Supply chain risk assessment approach for process quality risks”, International Journal of Quality and Reliability Management, 34 (7), pp. 940-954. Gomm, R. (2008) Social Research Methodology: A Critical Introduction, London: Palgrave Macmillan. Gorane, S. and Kant, R. (2015) “Supply chain practices”, International Journal of Productivity and Performance Management, 64 (5), pp. 657-685. Gorane, S. and Kant, R. (2017) “Supply chain practices and organizational performance: An empirical investigation of Indian manufacturing organizations”, The International Journal of Logistics Management, 28 (1), pp. 75-101. Gurnani, H., Mehrotra, A. and Ray, S. (2011) Supply Chain Disruptions: Theory and Practice of Managing Risk, New York: Springer. Ho, W., Zheng, T., Yildiz, H. and Talluri, S. (2015) “Supply chain risk management: A literature review”, International Journal of Production Research, 53 (16), pp. 5031-5069. Hohenstein, N., Feisel, E., Hartmann, E. and Giunipero, L. (2015) “Research on the phenomenon of supply chain resilience: A systematic review and paths for further investigation”, International Journal of Physical Distribution and Logistics Management, 45 (1-2), pp. 90-117. Howell, K. (2012) An introduction to the philosophy of methodology, London: SAGE. Huong Tran, T., Childerhouse, P. and Deakins, E. (2016) “Supply chain information sharing: Challenges and risk mitigation strategies”, Journal of Manufacturing Technology Management, 27 (8), pp. 1102-1126. Khan, J. (2011) Research methodology, New Delhi: APH Publishing. Khojasteh, Y. (2017) Supply Chain Risk Management: Advanced Tools, Models, and Developments, New York: Springer. Kilubi, I. (2016) “Investigating current paradigms in supply chain risk management - a bibliometric study”, Business Process Management Journal, 22 (4), pp. 662-692. Kirilmaz, O. and Erol, S. (2017) “A proactive approach to supply chain risk management: Shifting orders among suppliers to mitigate the supply side risks”, Journal of Purchasing and Supply Management, 23 (1), pp. 54-65. Kumar, R. (2014) Research Methodology: A Step-by-Step Guide for Beginners, London: SAGE. Manners-Bell, J. (2017) Supply Chain Risk Management: Understanding Emerging Threats to Global Supply Chains, London: Kogan Page Publishers. Manuj, I., Esper, T. and Stank, T. (2014) “Supply chain risk management approaches under different conditions of risk”, Journal of Business Logistics, 35 (3), pp. 241-258. McCormick, K. and Salcedo, J. (2017) SPSS Statistics for Data Analysis and Visualization, Chichester: John Wiley & Sons. Merriam, S. (2015) Qualitative research: A guide to design and implementation, Chichester: John Wiley & Sons. Munyuko, C. (2015) “Effects of Supply Chain Risk Management on Organization Performance: Case of Andy Forwarders Services Limited”, International Journal of Academic Research in Business and Social Sciences, 5 (3), pp. 380-403. Novikov, A. and Novikov, D. (2013) Research methodology: From philosophy of science to research design, London: CRC Press. Okongwu, U., Brulhart, F. and Moncef, B. (2015) “Causal linkages between supply chain management practices and performance”, Journal of Manufacturing Technology Management, 26 (5), pp. 678-702. Ouabouch, L. and Pache, G. (2014) “Risk Management in the Supply Chain: Characterization and Empirical Analysis”, The Journal of Applied Business Research, 30 (2), pp. 329-340. Patton, M. (2014) Qualitative research and evaluation methods, 4th ed., Thousand Oaks: SAGE. Prakash, S., Soni, G. and Rathore, A. (2017) “A critical analysis of supply chain risk management content: A structured literature review”, Journal of Advances in Management Research, 14 (1), pp. 69-90. Qazi, A., Quigley, J., Dickson, A., Gaudenzi, B. and Ekici, S. (2015) “Evaluation of Control Strategies for Managing Supply Chain Risks using Bayesian Belief Networks”, The 6th IESM Conference, pp. 1-9. Rao, A. (2008) Research Methodology for Management and Social Sciences, New Delhi: Excel Books India. Saunders, M., Lewis, P. and Thornhill, A. (2015) Research methods for business students, 6th ed., London: Prentice Hall. Schlegel, G. and Trent, R. (2016) Supply Chain Risk Management: An Emerging Discipline, London: CRC Press. Shukla, V. and Naim, M. (2017) “Detecting disturbances in supply chains: The case of capacity constraints”, The International Journal of Logistics Management, 28 (2), pp. 398-416. Singh, Y. and Nath, R. (2010) Research methodology, New Delhi: APH Publishing. Skipworth, H., Godsell, J., Wong, C., Saghiri, S. and Julien, D. (2015) “Supply chain alignment for improved business performance: An empirical study”, Supply Chain Management: An International Journal, 20 (5), pp. 511-533. Sodhi, M. and Tang, C. (2012) Managing Supply Chain Risk, New York: Springer. Sundram, K., Chandran, V. and Bhatti, A. (2016) “Supply chain practices and performance: The indirect effects of supply chain integration”, Benchmarking: An International Journal, 23 (6), pp. 1445-1471. Tsanos, C. and Zografos, K. (2016) “The effects of behavioural supply chain relationship antecedents on integration and performance”, Supply Chain Management: An International Journal, 21 (6), pp. 678-693. Vikulov, V. and Butrin, A. (2014) “Risk assessment and management logistics chains”, Scientific Journal of Logistics, 10 (1), pp. 43-49. Wahdan, M. and Emam, M. (2017) “The Impact of Supply Chain Management on Financial Performance and Responsibility Accounting: Agribusiness Case from Egypt”, Accounting and Finance Research, 6 (2), pp. 136-149. Waters, D. (2011) Supply Chain Risk Management: Vulnerability and Resilience in Logistics, London: Kogan Page Publishers.